One of my exciting finds at the farmers’ market was squash blossoms. I did my best to copy the delicious version I enjoyed at Sassi. Since I was set up to fry, and there was plenty of batter, I reached for some asparagus and orange bell pepper strips as well. They were dipped into the batter, the excess was allowed to drip away, then dunked in the hot oil for two to three minutes, rescued to paper towels to drain, and sprinkled with course sea salt. As we munched on the fried goodness, Kurt said “mmffghoodvegtblz mmmhhhgg.” He was chewing at the time, but I believe what he was trying to convey was that this is a superb way to eat vegetables. 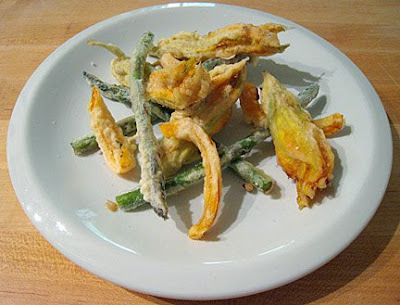 The squash blossoms were almost as delicous as those at Sassi, and the only change I might make next time would be to leave out the parmigiana. I think a simpler flavor combination would be nice. The amount of garlic and capers was just right. Barely perceptible garlic, and just a caper or two per blossom. The asparagus and pepper strips were fantastic, but what's not to like?